Great baking is always a labor of love. The making of this Panettone is a 46 hour labor of love! The classic Panettone has been made for hundreds of years using live sourdough mother yeast and lots of time. 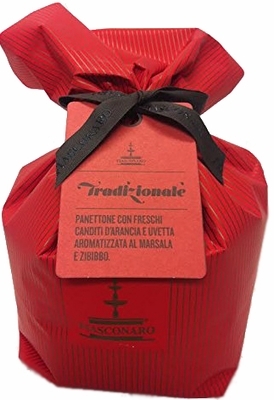 Fiasconaro Panettone is one of the few remaining followers of this great tradition and is made using a specially selected 40 year old live 100% sourdough yeast. A combination of the old baking art with the highest quality raw materials: Normandy butter, rare lzmir raisins, Sicilian citrus rinds, and the best Manitoba durum wheat create, in a 46 hour process, the richest and most moist Panettone. Buon appetito! Enjoy!